Maximum Ink: Hello Ian, it’s good to talk to you again. Last time we spoke you were in the midst of some traveling issues due to the volcano. I suppose that is somewhat common with all of the traveling you do over there. 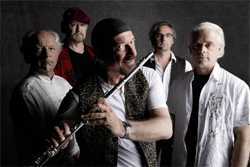 Ian Anderson: Yes, there’s no hopping on the tour bus from Detroit to Chicago for me. Things are a little more complicated where I live. It makes things a bit more interesting. Normally I wouldn’t travel on a bus. I’ll leave that to the Lords of The Trident, or the Miffllin Street Block Party, or Buckcherry. They probably love the tour bus – they’re probably younger than me and don’t need to shower that often. MI: Ah, I see you’ve found our website. Good deal. Anywho, lets start from the beginning. What was your first instrument and how did that evolve into a career and you taking an interest in so many different instruments? IA: Well, first of all I’m not really very proficient at anything other than the flute and the guitar. When you don’t have the technical skills in an instrument it allows you or forces you rather to work in more simple and direct terms which is a good thing if you’re writing songs. It forces you to keep things simple. My first instrument was an Elvis Presley plastic ukulele which I received in the post at the age of about 10. And it was, I believe, the last mail order I received because in the advertisement in the newspaper the Elvis Presley ukulele looked like a full sized guitar and it was being strummed by someone who looked uncannily like Elvis. However when it arrived it was about a foot and a half long, was made out of really flimsy plastic, it wouldn’t stay in tune, and it broke after the first couple of weeks. But it gave me the opportunity to tune something up and learn some chords. And then when I was 11 I got a Spanish guitar – a nylon string guitar which I put steel string on which caused it to break after a short while too. And it wasn’t until age 15 that I started to play guitar a little more seriously and started playing the blues. MI: Did you have an infatuation with music before getting that Elvis ukulele at age 10? IA: I quite liked music when I was about 7 or 8 because my father would listen to big band jazz, he had some 75 rpm records of Benny Kurtman and Duke Ellington and Glen Miller – that kind of stuff. And I didn’t think about it at the time but I think the reason I liked it was that it was very intricate music. It had a lot of forms and accents to it which was fun and being big band jazz, it would often incorporated the flattened fifth from the blues scale. And that was new to me because up until then all I knew was church music and some folk music. So that blues scale really caught my attention and the next time I really heard someone use it was on the first record I heard from Elvis Presley which I think may have been Heartbreak Hotel. I was never an Elvis Presley fan, I always thought he was rather silly and I still do frankly. Not as silly as his many imitators but pretty silly none the less. I didn’t really go for American rock and roll. It wasn’t until I heard Muddy Waters and Howling Wolf and Bo Diddley and stuff like that when I really got into American music – particularly black American folk blues – the acoustic blues. MI: I can sense that in your music. There seems to be some blues roots there. IA: Yes, along with a strong dislike of Elvis Presley. I think that Elvis Presley was very important in the formation of American music because he was the guy who brought together parts of black American blues and country western music. Much more than Bill Haley and the Comets who were more a rockabilly, innocent, white act to where Elvis had a bit of a theatrical menace to him which was moderately amusing for a very short while. He was very important but certainly didn’t fit my taste in music at the time. Then of course, he went on from being a rock and roll guy to being an extremely cheesy movie star. In his latter days on the casino circuit he wore rhinestone studded white jumpsuit which was terribly regrettable. MI: Its always sad to people like that, who have been placed on a pedestal at their strangest and darkest times. MI: Indeed. Though you have had some mainstream success your sound has been very original and it appears to me that you never changed your sound to fit anyone else’s tastes. It almost seemed that you were a mainstream band that was oblivious to what every other mainstream band was doing at the time. IA: No, we never tried to consciously change our sound but we did try to evolve our sound over the years. I was just listening to Thick As A Brick which we recorded in 1972 an that contained one of the earliest synthesizers which was made in the UK. It was called the ANS at the time. But we linked that up to a pitch to voltage inverter and I played my flute through this device which made the flute sound like some weird electronic instrument. It sounded quite horrible but nonetheless it was experimental use of new technology. Technology has always moved us to try new things - with the emergence of better guitars and amps to the 1980s where we saw the beginning of sequencing and sampling and the early computers in music. We’ve always kept up with new technology and used it on our records. But with the exception of a period in 83 -84 when we brought the electronic stuff to the forefront for a bit but for the most part, we’ve tried to keep it in the background without letting it dominate the music. And I think that would hold true today with the tools we use like our sound reinforcement and mixing boards and wireless systems – those things are part of what we do everyday. But nonetheless as an acoustic musician I would like to think that what the audience see and hear is pretty much instruments being played as if you were in the same room with me. I’m the acoustic guy in the band and I’m always a little hesitant about going down the road of electronics myself. But the electric guitar, electric bass and so on are just a part of what we’ve become. Although I am more comfortable with the sound of acoustic instruments and orchestral instruments because its easier to humanize then and put a personal touch an them. It’s easier to create the nuances and subtleties and expressions to where sticking a finger on a keyboard or sampler, it would sound exactly the same whether you do it or I do it. But if James Burway plays a note on the flute and I play a note on the flute it will sound considerably different, he will sound much better than I do. So I find it much easier to express myself musically with acoustic instruments. MI: Do you think that technology has a tendency to make musicians lazier and lose the skills to play acoustic instruments? IA: I’m sure some musicians have become lazy but its probably because they are playing a kind of music where that reliance on technology is just part of the music. And the programs that are written for performing recording music have made it easier for people who maybe don’t have the traditional skills to enter the world of music and find some creative outlet, and that has to be a good thing. I don’t think we all need to be technical wiz kids in order to make good music. But it certainly helps if you can play your instrument tolerably well. But as I said earlier, not being able to play your instrument terribly well can produce some special and striking music. For example Paul McCartney who had a very simple plip-plop bass technique and along with some very limited skills on the piano and acoustic guitar, he didn’t need to progress his proficiency over the years. It allowed him to write great songs, he didn’t have to be a great musician he just had to play well enough to realize his musical vision in terms of writing very good pop songs. But rather like Elvis, I’m not a Paul McCartney fan, I really don’t like his music but I think what he does he does it very well. And though it’s not what I like to listen to, I can still greatly admire and respect his abilities. On the flip side, there are a lot of incredible gifted guitar players, especially in America. People like Steve Vai and others like him, maybe their skill is more of a limiting factor when it comes to writing marketable popular music. And of course Stevie Vai is not in the business of writing peppy pop music, thank goodness. He writes for people who like more adventurous and technically excellent music. But he is less well know than a lot of guitar players from a lot of rock bands that only know six chords. Going back now to Tony Iomi, he wrote the book on writing very simple riffs with a limited technique which was partially due to the physical injury to his fingers from when he was a teenager working in a sheetmetal factory. So that set him on the path of having to make the best of what he had which fit his simple and direct form of writing and performing music which everybody loves. Even I do for ten or fifteen minuets. MI: You worked with Tony back in the early days didn’t you? IA: Yes, briefly. We knew him indeed before the time when Black Sabbath was born out of a Birmingham band that used to support the early Jethro Tull back in 1968. And Tony came on and played or rather mimed on a film – we performed on the Rolling Stones rock and Roll Circus which was a show that never aired until many years later when it came out on VHS. But that was the only time that Tony got together with us. And then shortly after his band went on to change their name to Black Sabbath and got themselves and image that caught the fancy of particularly the Americans. And around the time that they were making it big in the USA, we bumped into them somewhere and split the bill with Black Sabbath. This was around ’69 or something like that. But on that night Ozzy Osbourne wasn’t feeling so well and he had the great courtesy to come to me personally and tell me that he wouldn’t be able to do the show. I honestly can’t remember if we did the show without Black Sabbath or if the audience got their money back. But I do recall his respectful manner. MI: You seem to have a very good bond with your current guitarist, Martin Barre. MI: Do you have any new material in the works? IA: Well we always have some new stuff that we play on stage and there’s a lot of songs we mean to record which are in various stages of completion. But it’s a matter of getting everyone together and doing it. But it’s not a priority of mine to spend months in rooms with no windows to make a record which frankly isn’t going to be listened to by that many people in this day and age because there are so few physical records out there left. Its mostly iTunes at this point. And given the amount of records that are selling these days, recording one is not really a priority. I would much rather spend a month playing 20 shows in interesting places to lots of nice people than spending a month in a windowless room to make a record. But we have the opportunity to play those new songs on stage and we do it quite often. Its pretty common that we do a couple of new songs each show. Even our older repertoire can be subject to changes from time to time to keep things interesting.